J.C. Ryle is one of my favorite authors and is one of my spiritual heroes. He was born into a wealthy family in 1816. He went on to be a pastor, church leader, and author. Growing up he received a fine education, even graduated from Oxford. As the oldest son of the family, he was due to inherit his father’s many businesses and estate. But, when he was 25 his father’s bank went bankrupt, and his family lost almost everything. 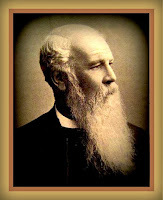 At this turbulent time J.C. Ryle decided to become a pastor and enter full-time church ministry in the Church of England. As a preacher, pastor, and writer, Ryle had a broad and wide impact on the evangelical church. It is hard to believe that this may not have happened if his father’s bank had not gone bankrupt. His story is a reminder that God works all for good for Christians. Trials and hardships can redirect our future paths. Difficult circumstances can reshape our character and make us more effective for Christ. Sicknesses can help us comfort the sick. Great loss can humble us and make us more dependent on Jesus. To learn more about J.C. Ryle, visit The J.C. Ryle Archive. To purchase some of his writings, visit his page on Amazon.com.